The Egyptians have had one of the longest continuous histories of any people on earth. For centuries they have lived along the Nile, a river that could be counted upon to make life along its shore not onoly possible but comfortable. As far back as Neolithic times, Egyptians were cultivating their valley, and as time went on, they developed a complex system of irrigation as well as a mathematics to make possible the measuring of their land. Egypt’s history is uniquely its own, as well as a history that is intertwined with the stories of other people—the Romans, the Persians, the Athenians, the Christians, the Arabs. Here, in his usual lucid and colorful style, Isaac Asimov tells of the story from prehistoric times to the present day. He tells of the great period of the Middle Kingdom when powerful Pharoas and priests ruled and the pyramids were built, of the time when foreign influence was strong and Egypt’s fate was linked with one Mediterranean power after another. He tells, too, of the religious influences that have shaped Egypt—ancient rites and gods, the Jews, the Christians, the Moslems. Asimov’s fourth history book is not quite up to the level of the earlier three. Like The Greeks, it suffers somewhat from trying to tell the whole story— with the last long stretch crowded into the final chapter (in this case, some 1300 years). This not only makes the narrative unnecessarily compressed, but it leaves us hanging in the mid-1960’s with Nasser in charge, and Egyptian history has hardly been uneventful in the last forty years. Then, too, I simply don’t find Egyptian history as fascinating as Roman, Greek, or Byzantine. Indeed, even here, there’s a tendency to emphasize (largely because our sources are better) Egyptian history during the period when it interacts with Greece, Rome, and Byzantium. This is actually good in the sense you get to hear the same stories told as were told in The Greeks, The Roman Republic, The Roman Empire and would be told in Constantinople, but told from the other side, as it were. 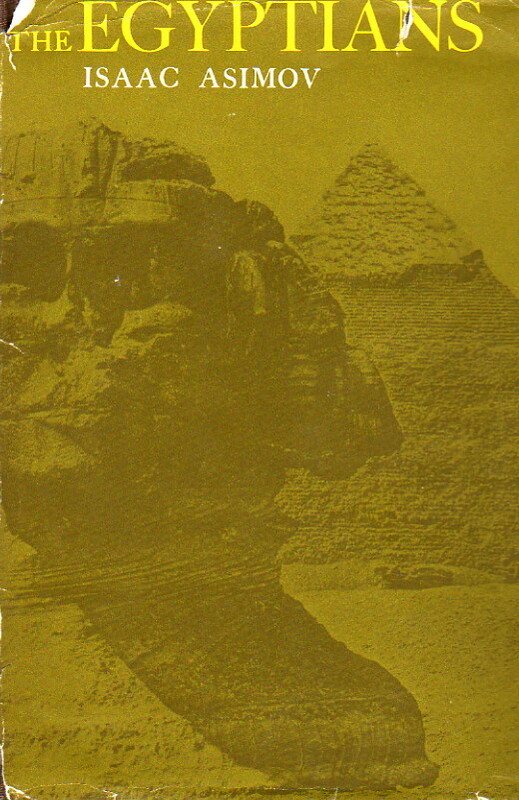 Thus, although I do find this an interesting and worthwhile book, and would recommend it to anyone interested in a first glance at Egyptian history, it is not among my personal favorites. A couple of extraneous notes. This one volume fails to match the remainder of the Houghton-Mifflin histories: The overall design of the book is the same, mind, but for some reason it is distinctly shorter than the other books. I don’t know why. I purchased my copy by ordering it from a local bookstore owned by friends of my parents. After waiting patiently for it to arrive, I went in to pick it up only to be told it wasn’t there. Another customer had seen it sitting on the shelf behind the register and expressed interest in it—and the clerk actually sold it to them! They were sure I wouldn’t mind waiting for a second copy to be ordered. Needless to say, I did mind, and yet I cannot but hope that the lucky soul who ran off with my original copy found it so fascinating that they went on to read everything else Asimov ever wrote. It would serve them right.